Semi hardy Sinningia tubiflora in the garden. This still relatively difficult to find, yet easy to master perennial will still need winter protection in Zone 5, but when grown in a container, it makes a fragrant, long-lived plant with delightfully fragrant, long-tubed flowers. When dormant, the potato-like tubers can be divided and shared with friends, for it produces many. The hardy Sinningia ( think - Gloxinia, yes, as in Florist Gloxinia and African Violets) are making a big impact with plant collectors. Hardy outdoors in zones up to USDA Zone 7, these tuberous-rooted perennials which also make great container plants, are really well performing plants worth seeking out. There are a few species being crossed together, to create these forms and new colors, mainly Sinningia tubiflora, which appeared on the scene about ten years ago with little fanfare, Sinningia curtiflora ( Corytholoma curtifolorum), Sinningia warmingii and Sinningia aggregata. 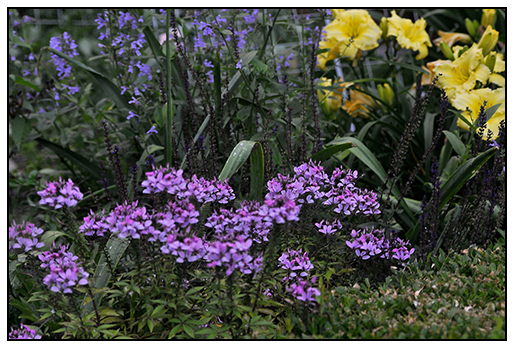 Now, gardeners can have not only white forms, but pinks and even pale yellow forms. If you are not growing this plant yet, you should. Just be patient, and don't fuss too much with them. I never had luck until I abused them, tossed a bag of tubers into a large pot and just let them do their thing outdoors. Now? The entire garden smells just like sun tan lotion ( yeah, suntan lotion - the coconut kind). Perfect. This container of S. tubiflora is three years old, I started with one tuber, and now the container is so full of compressed tubers, that I will need a sledge hammer to unpot it later in the winter. 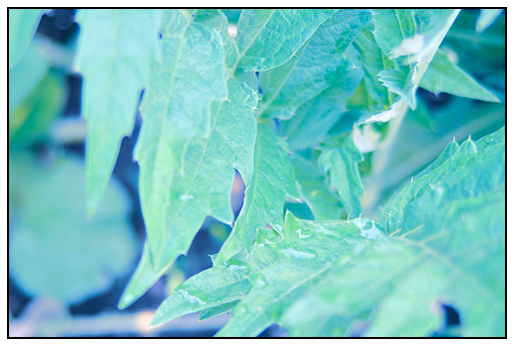 The foliage dislikes getting wet in the evening, it will discolor quickly. When watered in the morning, it will evaporate, especially when grown on a gravel walk, such as here. The extra heat helps keep the foliage dryer. Rain does not bother it. 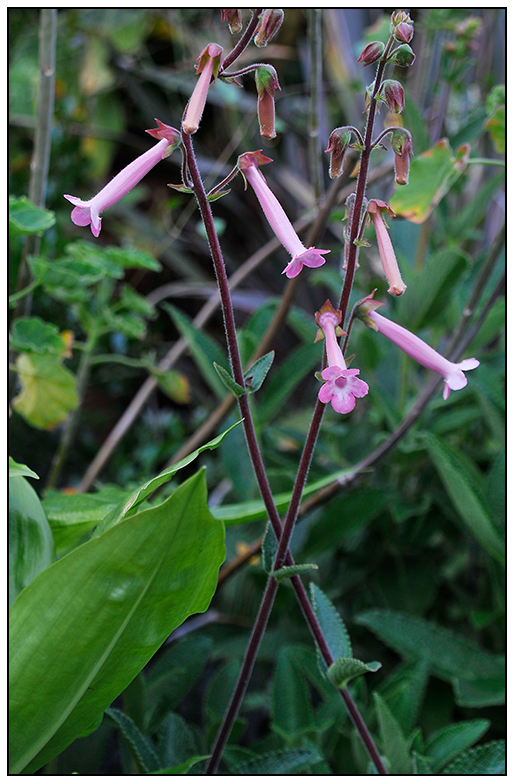 A new cross, Sinningia warmingii x Sinningia tubiflora came from a seedling raised from a Gesneriad Society seed exchange. It was names Sinningia 'Carolyn', and it is proving to be a real winner in many test plantings with stems as tall as 36 inches. I a. growing this one in a large, 12 inch clay pot . Introduced in 2011, it was trialed since 2007 with many rave reviews. 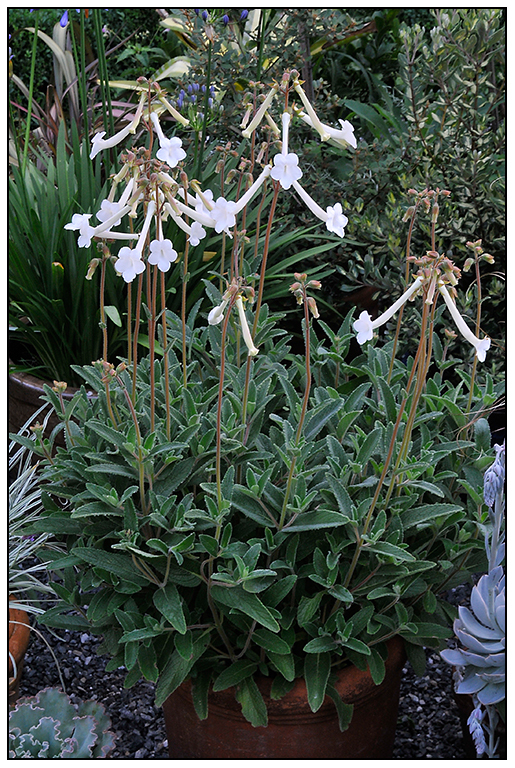 You can order it from Plant Delight Nurseries. So why are my hummingbirds pissed? This morning I watched them trying to get nectar out of these floral tubes, but alas, the tubes are too long ( or the beaks too short). Damn Darwin! He never planned on Plant Delights or the Internet. The colors of the Mediterranean are bright, sunny and rich, even in the shade. Olives ripen on the larger olive trees, and yes, I live outside of Boston where one cannot grow such jewels, but with proper care, one can grow Mediterranean plants most anywhere, even in Worcester, ( Wormtown) MA. 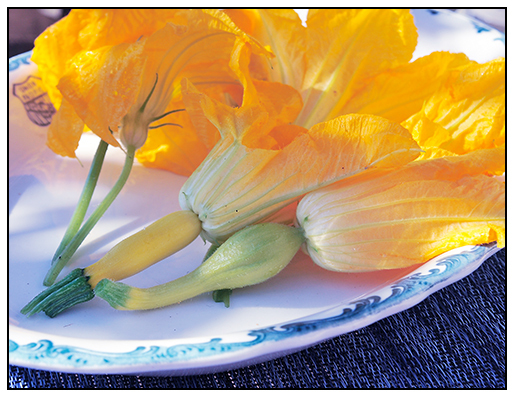 Squash blossoms awaiting to be stuffed with ricotta, pinenuts, Parmesan and basil for a late morning snack. They bees kept trying to get these, even when they came into the house. 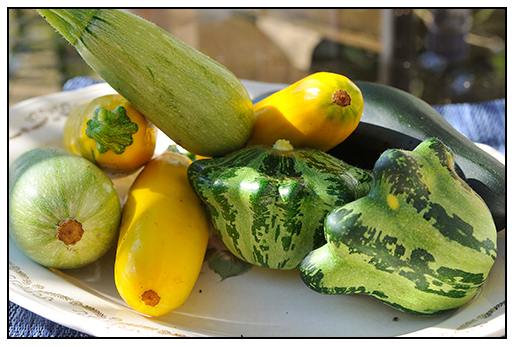 A selection of Summer Squashes picked this morning. Fritatti with ricotta on the menu this afternoon, with fresh rosemary and lemon. High summer means high romance, and nothing is more romantic than the sunny coast of France, Italy or Spain. When we imagine these places of high romance, we close our eyes, and we think of the sights, but mostly we think of the flavors, and the scents- all of which involve plants. The oleander of Costa del sol, Lavender and lemons of sunny morning in France, a Greek Island with olive trees, the salty, rich Bagna Cauda of Sicily made with cardoons that have been buried and forced underground - Mediterranean plants are deeply rich with volatile oils, fragrance and flavor and you can grow most all of them either in your garden, on your deck or even on your windowsill. 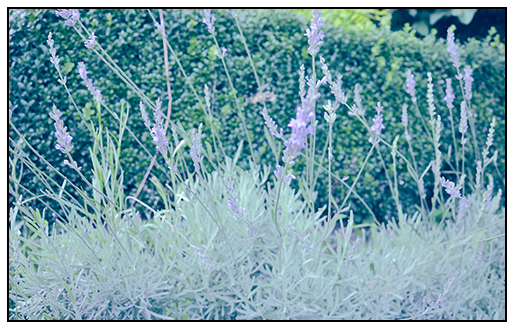 Lavender scents the evening air, especially when it is hot and humid. 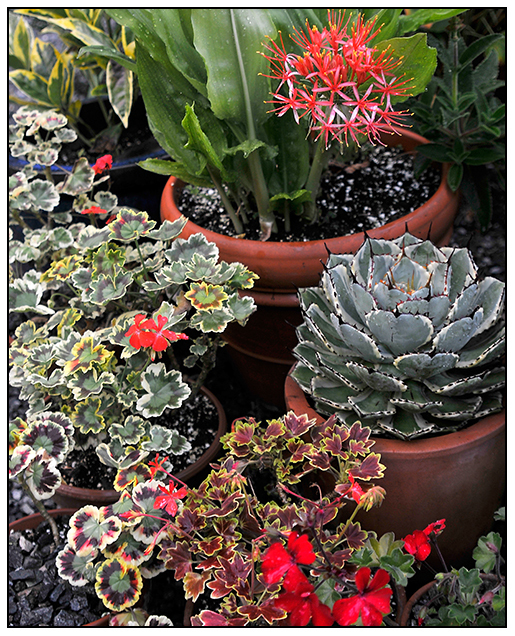 Mixed containers of Mediterranean plants at the greenhouse door. Kept near the hose, these sun lovers still need to be watered every day, as most container plant must be in the summer. Lots of sand used in their soil mix, ensures fast drainage. Cardoons, still young, will have to wait until autumn when they are then buried completely, to create the forced stems used for the most traditional Bagna Cauda, with crispy, twisted stems rarely found outside of the remote area of Italy where they grow them in this manner. 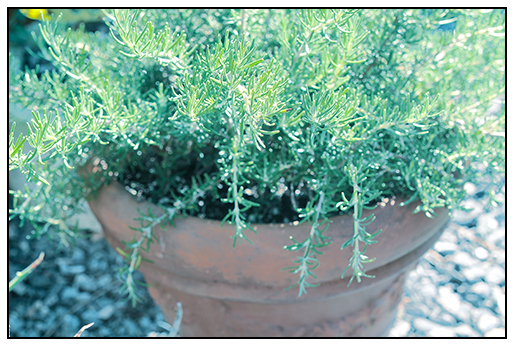 Rosemary comes in many forms, this one is a prostrate one, which will weep over the edge of this Terra Rosa container.Terra Rosa is a rare pink clay from southern Italy often used for low fired garden pottery. These plants are sun lovers. Sturdy and heat resistant, they still need daily watering if kept as hot as they like, but beyond that, they are tough and perfect for any hot, sunny garden. 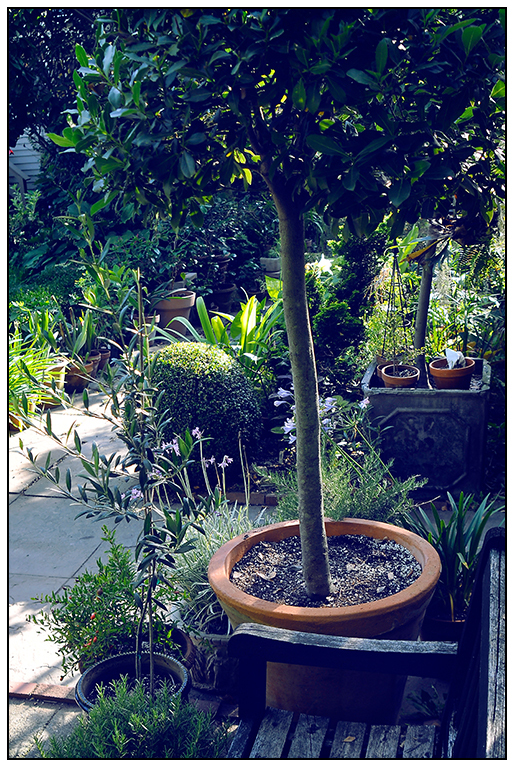 Larger shrubs and trees like olives must be grown in large containers and tubs, but think ahead, for size is important here, olives love room ( and they need more than one variety for pollination). They can be dragged into a cool cellar in the north, in into an unheated garage if there is a window where they can spend the winter. 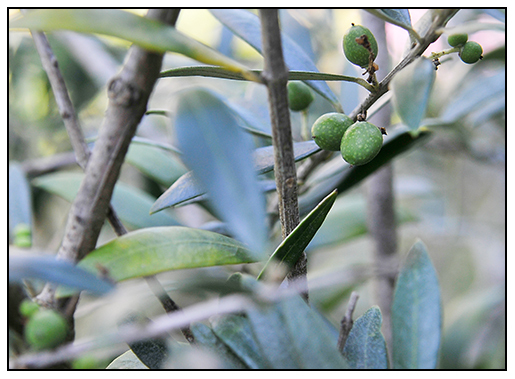 Olives require more than one variety for proper pollination. This one is young, a sapling really, but it will mature fast once it gets repotted into a larger container. 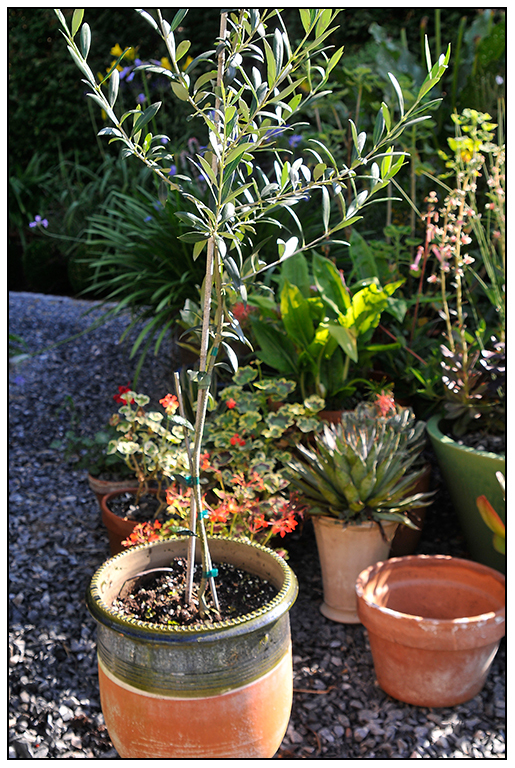 It must spend winters in the glasshouse with the larger olive trees, which are planted in 30 gallon tubs and becoming almost too large to move. 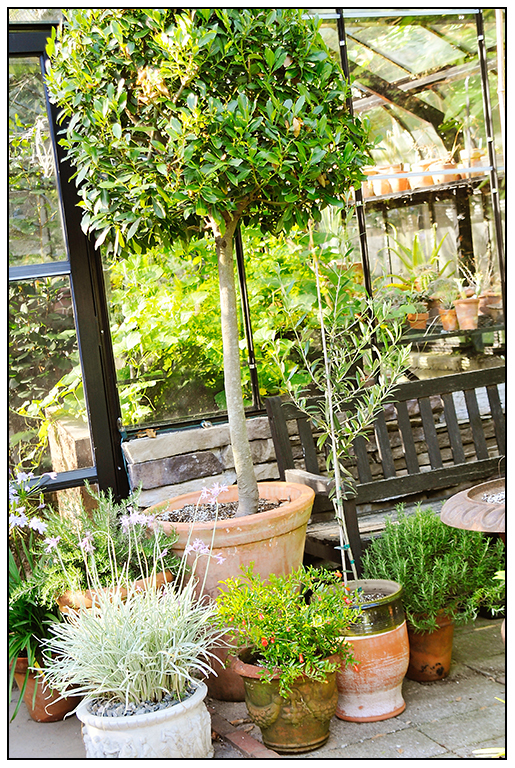 Trees from the south of France and Italy such as olives are remarkably easy to grow in containers, as long as they are large enough. Have confidence, and pot some up. Use 1/3 sharp sand, 1/3 garden loam, and 1/3 compost for best results, but olives require something very important if you want fruit, and that is a pollinator. 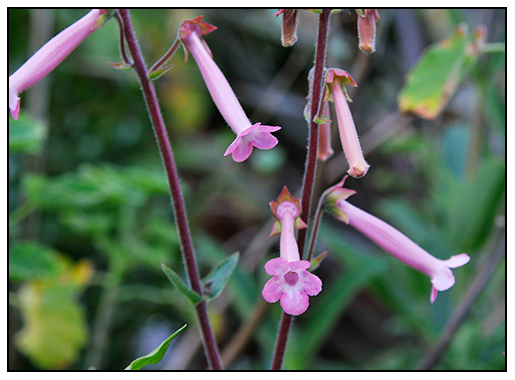 There must be more than one plant, and preferably more than one variety for proper pollination. They are long lived, and many can be left out-of-doors even here in New England, until nearly Christmas ( when temperatures can begin to push near 15 degrees F, which is too cold, really). 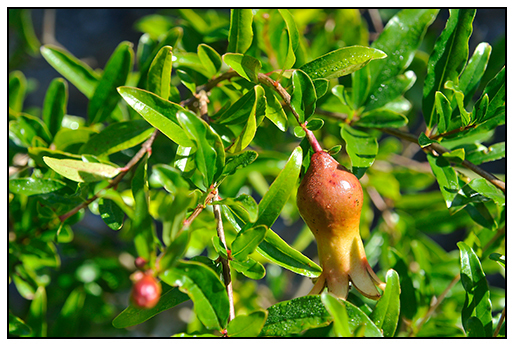 Pomegranate fruit, when young, looks very much like a flower, but there is no mistaking what a flower looks like on this beauty. Poms make very ornamental plants, even this one. There are more than thirty varieties, from Iranian green, to those that have solid black colored fruit from Turkey. These Mediterranean gems are hardy enough to handle light to moderate frosts, and I trust my Rosemary and Olives with temps that are above 20 degrees. After that, I drag the tubs into the greenhouse, wintering over in the cold glasshouse until March, when I bring them outdoors again. 'Mediterranean plants', is a term often seen in plant books and magazines, but it is a broad term, loosely used often to refer to any plant seen or used as an ornamental plant outdoors in and around the Mediterranean ( Turkey, Greece, Spain, Portugal, Morocco, France, Italy - but I use it to cover those plants common to those living on the coast in southern to northern California too. Our new hot gravel bed, circular walk, really, in the courtyard on the east side of the house is the perfect place for many of these containers, sunny and hot all summer long, with late afternoon shade from the house. I can water every evening when I return home from work, which is like therapy for me, hose in one hand, and glass of wine in the other ( how 'Mediterranean!). The two large Bay Lauren trees in front of the greenhouse are almost too large to move, they must be repotted this fall, I hope that I can find a matching pair of large tubs for them. 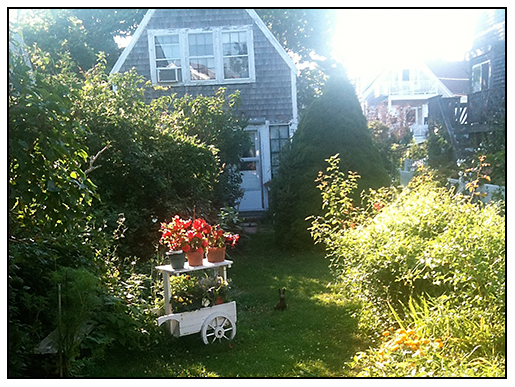 I spent a few days in Wellfleet, on Cape Cod in Massachusetts. Our family rents a home in the dunes every year, and even though I only drove out for a couple of days, it was restful and the weather was beautiful. Yesterday we walked the streets of Province town, and I was struck by how many little, well-designed gardens there were. 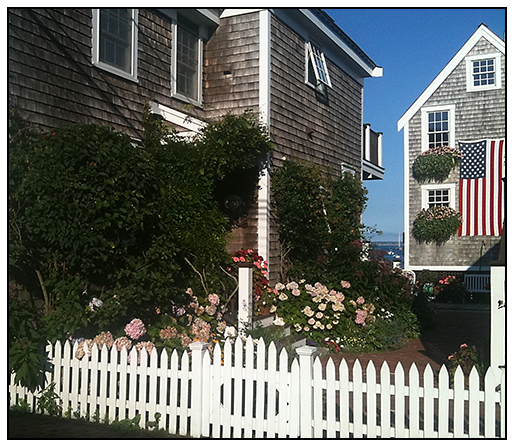 Cape Cod is nearly zone 7 in parts, so Hydrangeas and other more tender shrubs thrive. SOME SMALL GARDENS LOOKED AMAZING, EVEN THOSE WHO MADE ONLY A LITTLE EFFORT. EVERYTHING LOOKS NICE IF YOU HAVE CHARMING ARCHITECTURE AND THE OCEAN NEAR BY! I LOVED THIS IRON BUNNY SITTING IN A COTTAGE GARDEN LAWN. 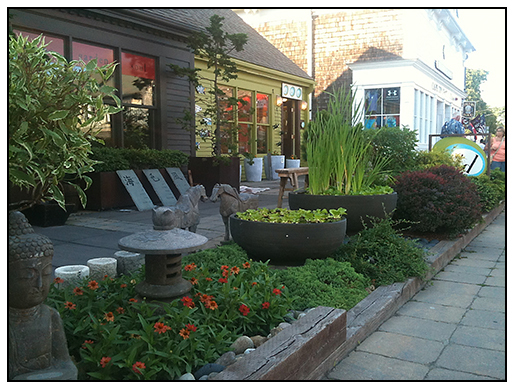 ON COMMERICAL STREET IN PROVINCETOWN, THIS STYLISH GARDEN SHOP HAD AN IMPRESSIVE SIDEWALK GARDEN, WITH EVERY SHRUB TRAINED INTO A SQUARE GRID. EVEN WITH A LOT OF PAVERS, A FEW SHRUBS CAN MAKE A STRONG IMPACT. Back at the rental house in the Newcomb Hollows area of Wellfleet, the world changes into total silence. 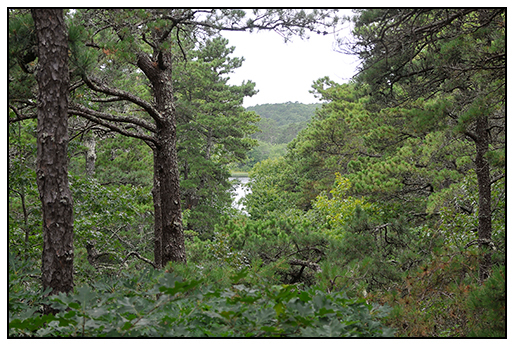 The ocean is a quarter mile away through the dunes, and a private lake which you can barely see in this photo, is a short walk through the pine forest. It was cloudy today, but last night, the sun sets right through this crevice.protected lakes with no houses, and total silence sans some woodpeckers, the entire area is now under the protection of the Cape Cod National Seashore and no one can build in the Hollows, only those lots sold in the 1960's exist, and the nearest house is a few thousand feet away. 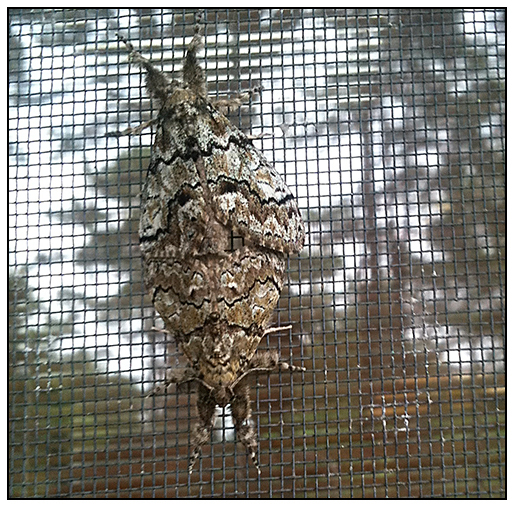 This morning we found these two moths on the screens. 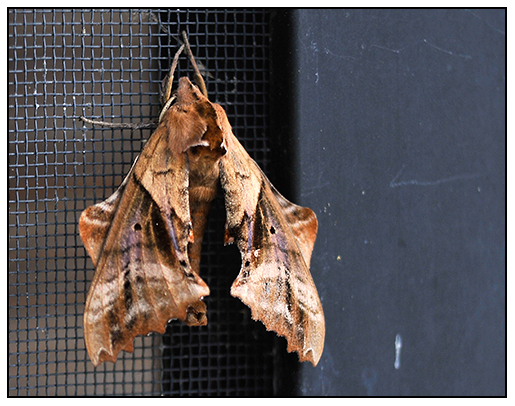 Above, a Small Eyed Sphinx Moth (Paonias myops) looked exactly like a piece of the pine bark in the forest that surrounds the house. A few minutes later, another bark-camouflaged moth, a Dasychira (basiflava?) appeared on another screen. My limited moth knowledge assumes that these two are mating? They had very hairy legs, almost like spiders! A HYBRID HYMENOCALLIS, OR ISMENE 'SULFER QUEEN' OPENS IT'S HIGHLY FRAGRANT FLOWERS GROWING IN A CONTAINER ON THE WALK TO THE GREENHOUSE. 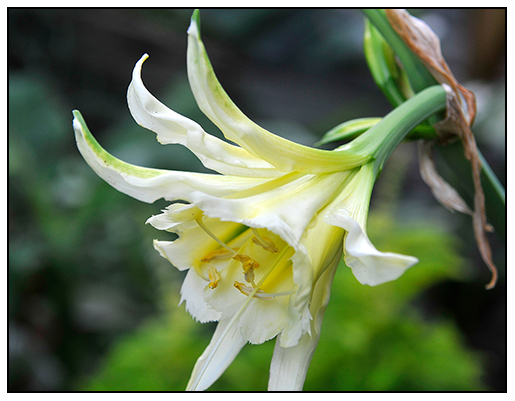 Ismene 'Sulfer Queen', and named hybrid of the more specific genus now called Hymenocallis, a collectible genus for those who like to collected things that are similar, but still organized withing a genus - see here at the Pacific Bulb Society Web Wiki. Looking for something different to collect? Try growing some of the more unusual species, for the rest of us? 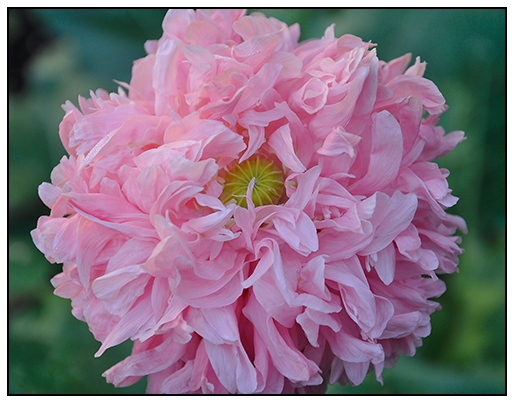 Try the easy-to-grow and bloom hybrids that one can find at any garden center in the spring. 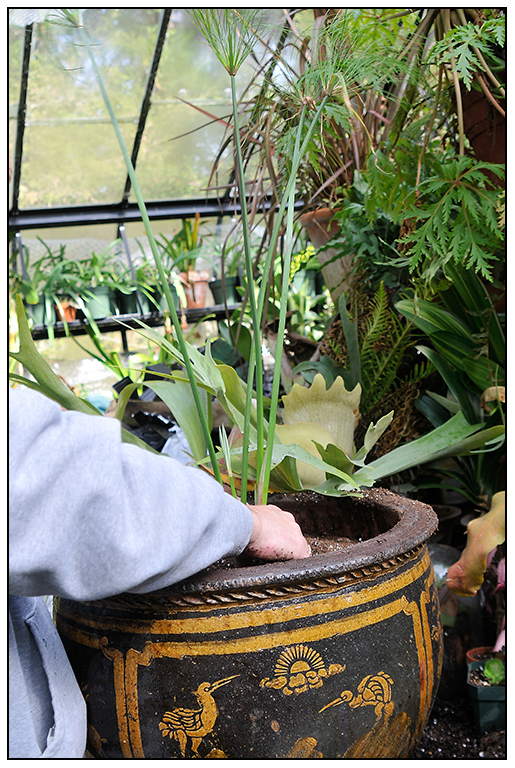 Ismene get better each and every year, so save your bulbs, and since they are in the family Amarylidaceae ( the Amaryllis family) allow the bulbs to go dormant, but the roots will prefer to remain fleshy and thick, deep in the soil. Every year, upgrade the pot size significantly while dormant, without disturbing the roots, and in a couple of years, you will have a tub full of these Peruvian Daffodils. I upgraded the pot size on this Ismene in February, when I noticed that the pot was full of roots. Now, I can see that I needed to upgrade to a much larger container, which I will do next week, carefully. These are tender sub-tropical bulbs, and they cannot handle freezing, so containers must be brought in after a light frost and allowed to dry out. OK, I KNOW, IT'S SO NOT ME, BUT KIDS LOVE THIS SORT OF PLAYFUL THEME. 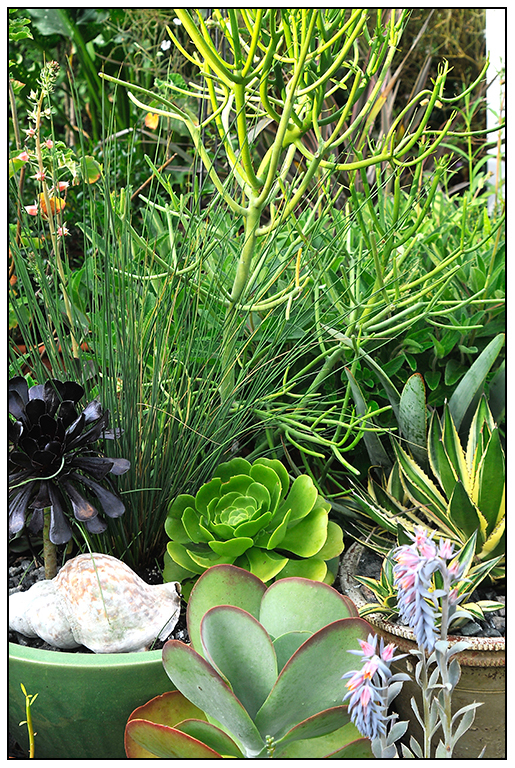 YOU CAN STILL CALL IT WHAT EVER YOU WANT, I AM CALLING IT 'UNDER THE SEA" WITH SUCCULENTS CAN SOMETIMES LOOK LIKE UNDERSEA CORALS, BRANCHED EUPHORBIA'S, CIRCULAR AEONIUM SPECIES AND OTHER PLANTS WITH INTERESTING FORMS CAN LOOK GREAT WHEN PLANTED TOGETHER. JUST ADD SAND AND A SHELL. ( OR A MERMAID/SHARK'TRUNK-WITH-BUBBLES). SUCH JULES VERNIAN THEMES MIGHT EVEN VERGE ON STEAM-PUNK GARDENING. 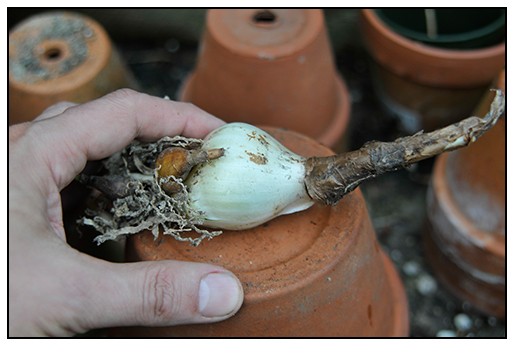 First of all, the winner of the Stenomesson bulb is Les! Please email me personally at mmattus@charter.net with your mailing info, and thanks to everyone who entered! 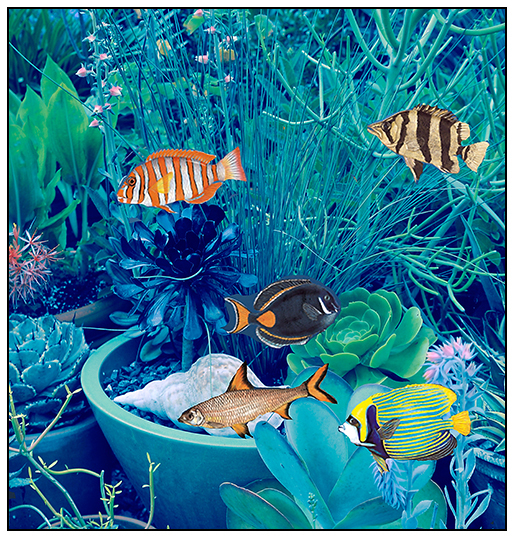 Just a little fun here on a hot night in July - I once saw an old photo from a botanic garden somewhere of plants that looked like they belonged under the sea. 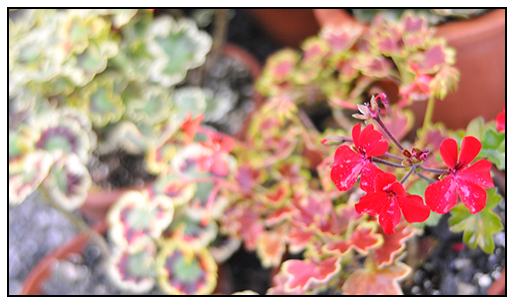 This planting was not intentional, but after looking at it a bit, I can see that somehow, that image influenced me. Just goes to show you that inspiration can come from anywhere, when it comes to theming containers. I added the shell yesterday after I realized what it looked like! ONE OF THE OLDEST USEFUL PLANTS TO MANKIND, THE PAPYRUS (CYPERUS PAPYRUS) PROVIDED PAPER TO THE PHARAOHS, AND SERVED AS CONSTRUCTION MATERIAL FOR BOATS IN EGYPT. TODAY, IT IS A COMMON AND USEFUL ORNAMENTAL PLANT FOR PONDS AND CONTAINERS. 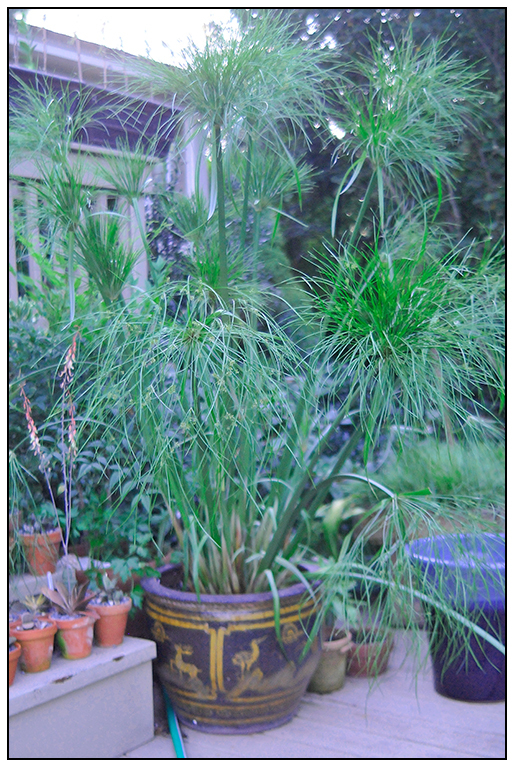 Nothing beats the Papyrus, as a potted plant specimen, it grows fast, and lush in just one season. If you remember, I potted this plant in February, in the greenhouse where it grew slowly until moved outdoors for the summer. With todays 103 degree heat, it looks perfectly at home, and it may even think that it is growing on the Nile. Back in February, you may have thought that this container seemed too large, but in fact, the container could have been larger. This is a plant that prefers to grow in water, but it doesn't have to, this year, I am just being sure to water this pot twice a day. It is now nearly 7 feet tall. This is a fast growing sedge, which is also knowns as Bullrush. POTTED IN FEBRUARY, THIS CONTAINER MAY SEEM TO BE TOO LARGE, BUT NOW, YOU CAN SEE WHY I CHOSE IT - AND THE SUMMER IS ONLY HALF WAY OVER. BY OCTOBER, THIS PLANT WILL COMPLETELY FILL THE POT, AND IT CAN REACH 9 FEET TALL. Our giant ( and I mean G I A N T) gardenia bush is starting to bloom. It's so large, that we keep it in a 40 inch tub and it is nearly 6 feet tall with a trunk that is about 8 inches in diameter, even after being cut back hard last year. It is 40 years old, and inherited from a friend, who got it from a friend, etc. 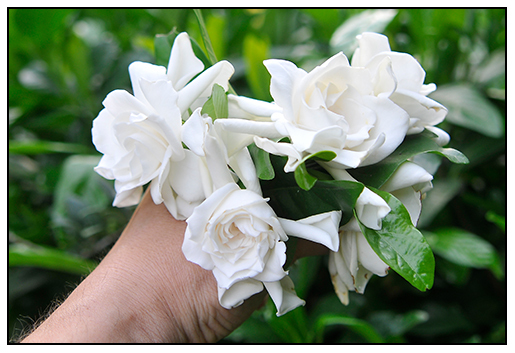 Nothing compares to the rich scent of gardenia on a hot evening, like heavy cream and jasmine. This is particularly true with the flower of the moment here in July, the lilies. If you drive off on this hot day to your local garden center, you will find 5 gallon pots of Stella d'oro Daylilies, 2 gallon nursery pots of Asiatic lilies and even some fragrant OT's or Oriental Trumpet crosses that have been recently introduced ( like the super awesome Conca d'Or - and there is nothing wrong with any of these proven winner-type plants, but.....oh, there are so many more that may never make it to your store until they are tested, micro-propagated and marketed, which can take years. 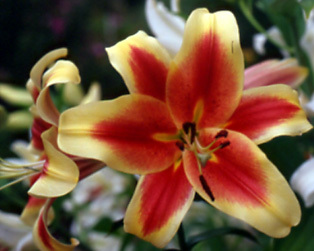 These new winners, especially those introduced each year by specialty breeders are THE lilies to try. Why not grow this season's beauties, long before they make it to the ready-to-wear mass market nurseries? THIS ORIENTAL - TRUMPET CROSS IS CALLED SWEETHEART - YOU WON'T FIND THIS $5 BULB AT YOUR GARDEN CENTER, BUT YOU CAN BUY IT ONLINE. You will always need a foundation of classics, bargains, good-deals and every-day plants, but why settle for a Stella d"Oro daylilly when you can have the hottest daylilly of 2020? ( not that there is a 'Hottest"but there are many hot new varieties each year). 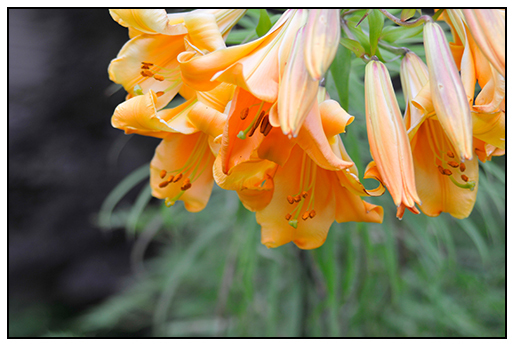 Trumpet Lilies, Lilium longiflorum and crosses between the giant, fragrant mid-summer Oriental lilies and Trumpet lilies are all the rage. Order lily catalogs now ( mine from B&D Lilies just arrived), and just see what you could have - don't settle for everyday ready-to-wear lilies, the 'couture' ones are sometimes even cheaper. STELLA-D'ORO MIGHT BE FINE, BUT THERE ARE FAR BETTER DAYLILIES TO TRY. 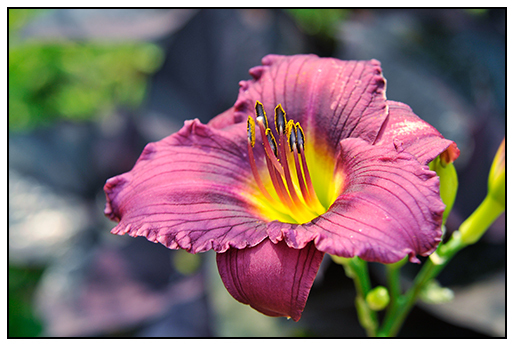 HEMEROCALLIS, OR DAYLILIES ARE NOT TRUE LILIES, BUT JUST AS VALUABLE AS SUMMER FLOWERING PLANTS. LOOK FOR NEW VARIETIES LIKE THIS, FOR YOUR GARDEN INSTEAD OF SETTLING FOR MASS-PRODUCED VARIETIES ( THEY'RE NICE TOO, BUT WHY NOT EXPLORE DEEPER AND LOOK FOR MORE UNUSUAL FORMS?). 'LITTLE GRAPETTE', A SMALL-FLOWERS PURPLE DAYLILY, AND ONE THAT LANDSCAPE STARCHITECTS LIKE PIET OUDOLF FROM THE NETHERLANDS, KEEP ON THEIR MUST-HAVE PLANT LISTS. 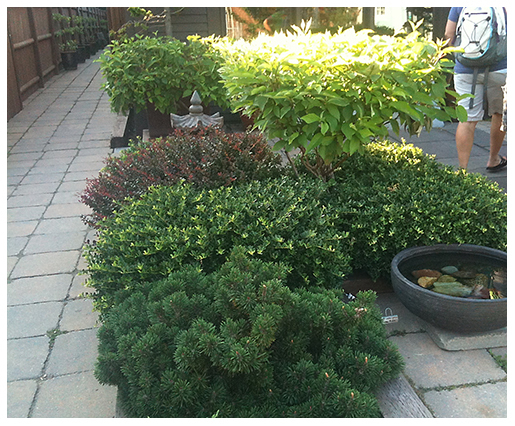 Mid summer is a great time to start cutting for potted topiary trees or to train existing topiary. 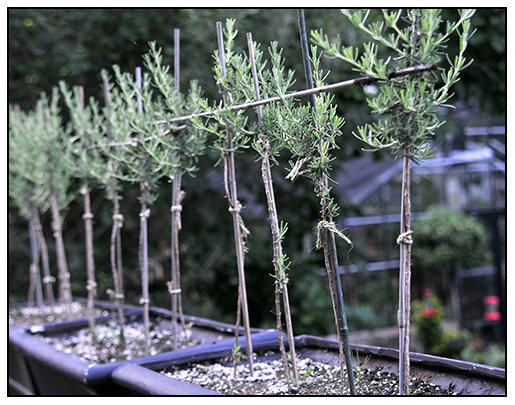 This year I am trying a few different things, and the most exciting is my project called Pleached Rosemary Hedge, which I am growing in four window boxes. Pleaching trees or shrubs, is a classical training method that usually involves weaving branches or trimming and training a series of trese or shrub to create what is essentially a raised hedge. What I am doing it bringing it down in scale - really down. I am not sure what I will do with my tiny hedge, but it is portable, since I am growing it in window boxes, so at the very least, it will look nice on the railing of the deck, or along a walk. 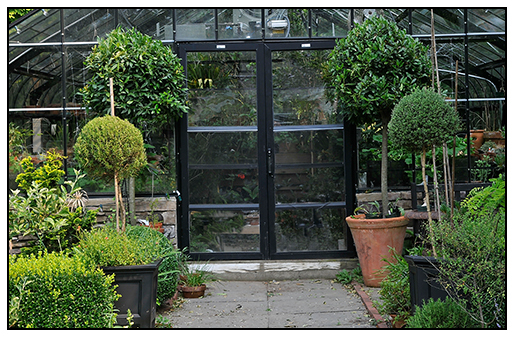 THE TWO LARGE TOPIARY TREES ON EITHER SIDE OF THE GREENHOUSE ARE BAY LAUREL TREES, AND THE TWO SMALLER TOPIARY TREES ARE A ROSEMARY ON THE LEFT, AND A WESTRINGIA ROSEMARIFOLIA ON THE RIGHT. THESE SMALL ROSEMARY TREES ARE IN NEED FOR A TRIM, IN FACT, A TIGHT TRIM ALMOST BACK TO THE MAIN STEM. WHY? BECAUSE A DENSE INTERIOR BRANCHING WILL GIVE YOU A TOPIARY THAT IS MORE FULL, AND LESS LIKELY TO SPLIT. Ground hog or Skunk Troubles? I might call this stuff, SkunkAway. I WAS SKEPTICAL, BUT PLEASED WITH HOW THIS ALL NATURAL ANIMAL REPELLENT WORKED, ESPECIALLY ON SKUNK HOLES UNDER OUR PORCH AND GROUND HOGS AROUND OUR GARDEN. MADE BY A COMPANY (HAVAHART) I THOUGHT ONLY MADE BIG TRAPS THAT MY DAD USED TO USE. SPRAY OR GRANULAR FORM, AND IT'S ALL NATURAL, REALLY, PEPPER OIL AND ALL. This past Friday I was invited to a party after work with friends who lived in beautiful modern new home that they built in Rhode Island, on the ocean. In their back yard, the had a few raised bed of vegetables, which we enjoyed viewing from high above on their very cool, and well designed deck. With the view of the water, the sail boats and the modern furniture, I kept saying that it felt as if I was staying at a very stylish boutique hotel, and not a private home....but then amongst the screams and rum-induced laughter, I saw the owner, far below us, waving an oar from a paddle board at this poor little woodchuck, who was munching some arugula in her little garden - arugula that sadly will never make it onto a goat cheese pizza made in her amazing cast iron grill. For the past five years. we've been plagued by garden pests, even with three terriers who have full range of the garden. We've tried fences, patching up holes in the perimeter fence, fox pee, you name it, even trapping ( which works if you are home long enough to deal with it, and with trapping, there is always the 'deal with it' part i.e. drowning), but nothing really worked well. I was looking for something organic, safe and easy to apply, and I think I found it. 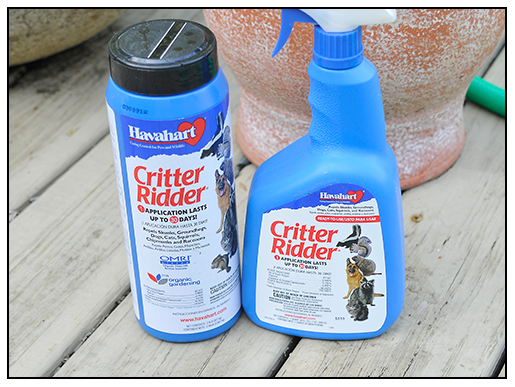 Thehttp://www.havahart.com/store/animal-repellents Havahart company is familiar to many of us who have gardens, for their well know traps that can capture most small animals, but did you know that they also sell many other types of pest control that is safe? 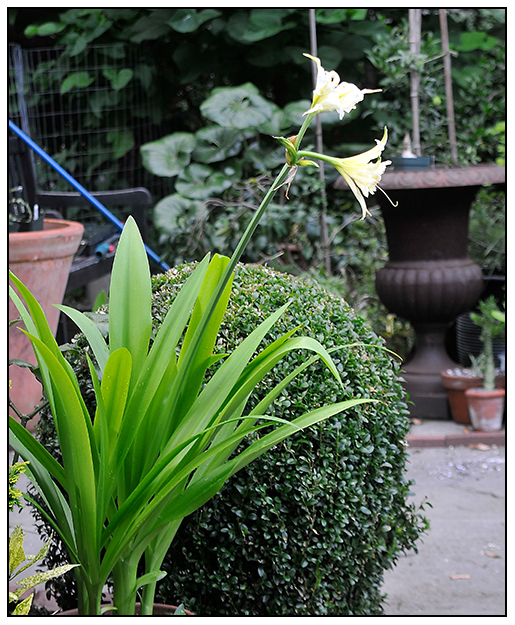 FREE GIVEAWAY - A RARE STENOMESSON PIERCEI BULB, and one that it BLOOMING SIZE. JUST FOLLOW THE RULES BELOW, AND ADD A COMMENT TO THIS POST TO ENTER. I WILL USE A RANDOMIZER SITE TO SELECT THE WINNER THIS FRIDAY AT NOON. 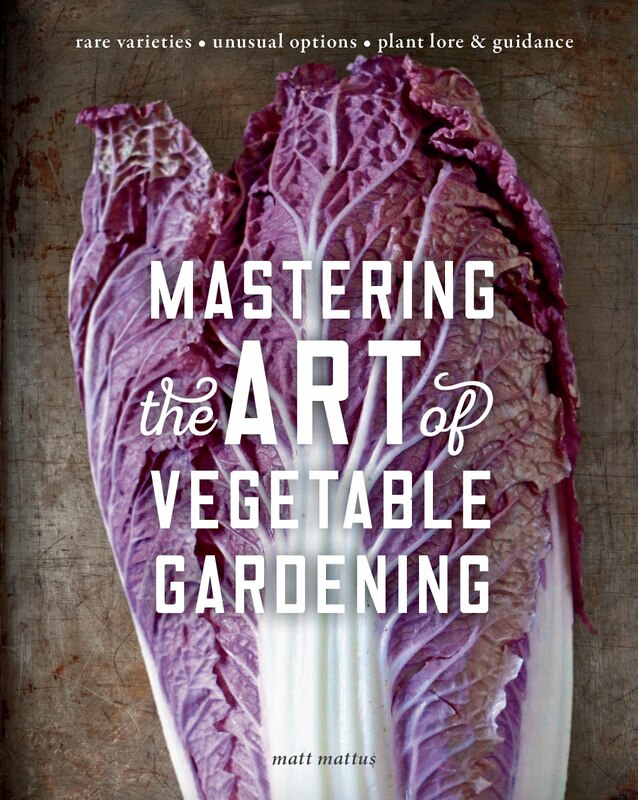 I've decided to join the ranks of some of the other top-ten garden bloggers, and start having periodic giveaways, but I am going to do it differently. Instead of giving away my book, or free product donated by other companies, I have decided to make my giveaways something a bit more unusual - like, some of my rare bulbs, seeds or plants I and an occasional book that I might have ordered two of by accident!). The rules are simple, All you need do is some of these things. ( my randomizer will calculate who is the winner, so it doesn't matter if you do more than three of the following things. 1. Add a comment the easiest way to enter. Just add the words BULB CONTEST. I will announce the winner on FRIDAY. You can then email me your mailing address. 2. "like" this post or blog if you have not already. 4. Add a RSS link, if you have not already. 5. Doing something 'viral' to help promote my blog. ( just let me know). I might have a special prize for you! OK, full-disclosure here, this is mostly about increasing my ratings, my RSS subscriber numbers, that's why other blogs do giveaways, but if I'm going to do giveaways, I know that my readers what extraordinary prizes, most likely, prizes not available anywhere, even on rare bulb sites or eBay. I say 'mostly' because at the same time, I love sharing some of my extra bulbs, seeds and junk that I know you will love, and I think this might be the best way. I only get a few to share, and I rather not sell them. This first week, my giveaway is an awesome one - a large, blooming size bulb of the South American native STENOMESSON PIERCEI. You may remember it blooming in my greenhouse last January. Easy to grow, it likes three months of dry conditions and then moisture, to stimulate it to send up a bud. 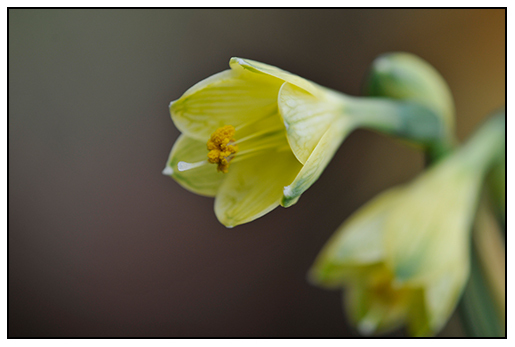 These are highly difficult bulbs to find, and they are rarely available anywhere except from collectors. JULY GIVEAWAY - FREE STENOMESSON PIERCEII bulb. THIS IS THE ONE YOU CAN WIN. Rhododendron viscosum x 'Weston's Lemon Drop'. If only this was scratch n' sniff! The mid-summer blooming azaleas are my favorite. 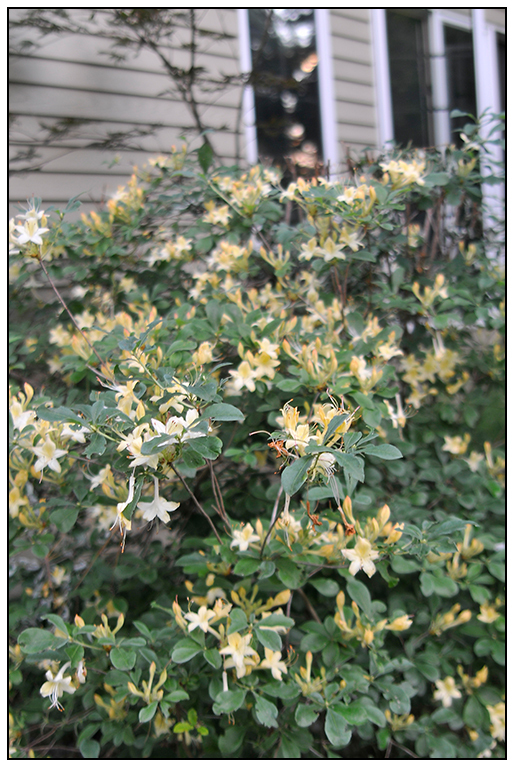 Tall shrubs for foundation plantings or woodland, with white, pink or yellow- intensely spicy and richly creamy scented blossoms not unlike Oriental lilies. They are the perfect accompanist for hot, humid summer evenings while drifting amongst the June bugs, resting on screened windows. 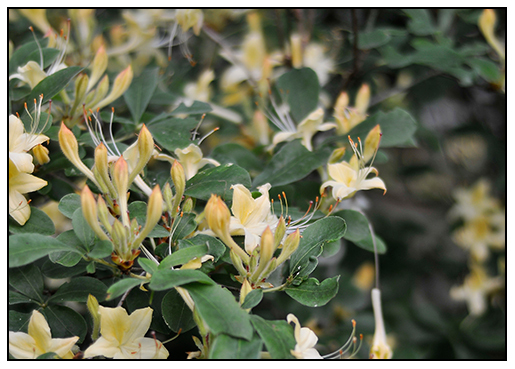 If you haven't grown any deciduous azaleas, do consider these summer blooming shrubs, they are more hardy, look fine year round, with excellent branching, vertical form and brilliant autumn foliage, and of course, for their fragrant blossoms in June and July. I live in Massachusetts, which is where it all began for many of the finest crosses. I have a special affinity for our native Rhododendron viscosum, which blooms along the trails of my local hiking mountain, Mount Wachusett near my home, but for the garden, there are many species, and crosses that are worth seeking out. The crosses I prefer by far, are any with made with R. viscosum as a parent, and thanks to the late Mr. Mezitt of Weston Nurseries here in Massachusetts, many of us in zones 4 and up and now grow these fragrant summer blooming shrubs, of course, if you can find them, for once again, these are not shrubs that you will find at a home center garden shop, you must search them out. 'LEMON DROP' CAN GROW QUITE TALL, AFTER TWELVE YEARS, OURS IS 9 FEET TALL, BUT WITH CAREFUL PRUNING, ONE CAN REDUCE IT'S HEIGHT TO 5 FEET ANNUALY. PLANTED UNDER A WINDOW, IT'S SPICY-SWEET SCENT CAN FILL A HOME WHILE IN BLOOM. IT'S LIKE NEW ENGLAND JASMINE. The story of how these modern crossed came about began in the 1930's, here in Massachusetts what after a particularly harsh winter, Ed Mezitt of Weston Nurseries started breeding and selecting plants in search for a very cold-hardy form of deciduous azalea ( all azaleas are Rhododendron). 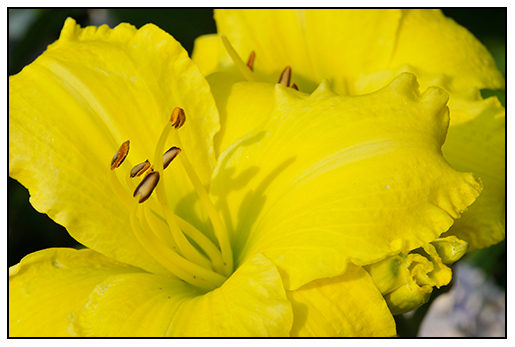 One of the finest crosses from the Mezitt program is a fine yellow summer bloomer, 'Weston's Lemon Drop'. But other color form are now available, in pinks, reds, and whites. Other pure species of deciduous azaleas worth finding now on line, to plant in the autumn would be R. viscosum 'Betty Commins'-Pink Swamp Azalea, which is a highly fragrant form of the pink swamp azalea. 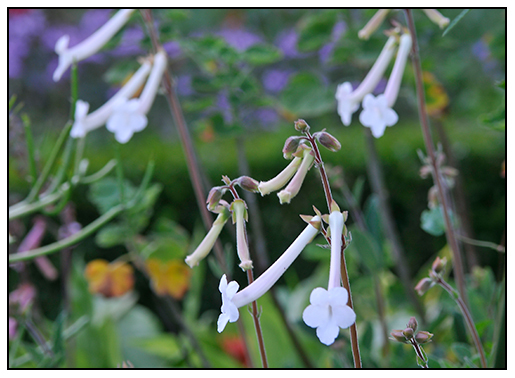 You can find them at a few on-line nurseries such as Fairweather Gardens and Greer Gardens. I recommend the June and July species and crosses more than the May and June blooming forms which seem too tropical and , well, 'hybrid'. These include the Exbury forms, they are just too showy for my tastes. I tend to prefer the wild or more natural looking forms. 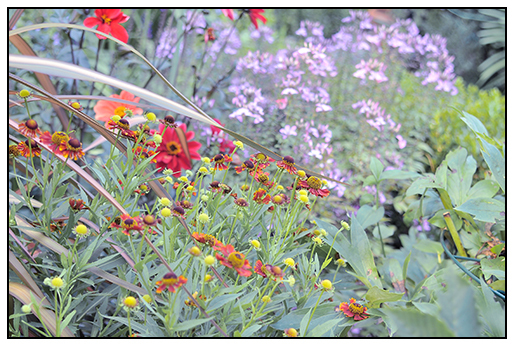 HELENIUM, OR SAINT HELEN'S FLOWER ILLUMINATES THE EVENING PERENNIAL BORDER. 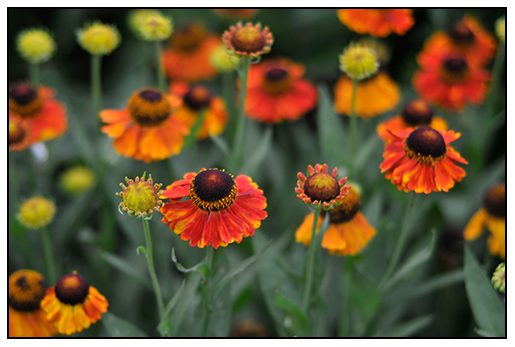 MANY PEOPLE BELIEVE THAT HELENIUM PREFER HOT, DRY GARDENS, BUT THEY PREFER MOIST SOIL, AND A LITTLE SHADE LATE IN THE DAY. NATURALLY, PLANT MORE THAN THREE PLANTS FOR A MORE IMPRESSIVE DISPLAY. LOOK FOR THEM NOW, AT GARDEN CENTER'S, SINCE THEY ARE RARELY FOUND FOR SALE IN THE EARLY SPRING. THE LONG BORDER'S STONE WALK, FRESHLY WEEDED BY OUR HIRED YOUNG GARDENERS LEADS TO THE BACK AREA OF THE PROPERTY WHERE THE POULTRY COOPS SIT. WE COULD USE AN HERBICIDE LIKE ROUND-UP, BUT CHOOSE NOT TO, OPTING FOR BACK-BREAKING HAND WEEDING. . MISCANTHUS FLORIDULUS, A 10 FOOT TALL GRASS, TOWERS HIGH ON THE FAR RIGHT. BY SEPTEMBER, IT MAY REACH 12 FEET. For whatever reason, I never think of July as a favorite time in the garden. Here in New England, we look forward to the first flush of spring, and then June when all of the first perennials bloom, and then of course there is late summer when everything seems to explode into growth, but mid-summer can be an equally rich time in the garden. When I was growing up, the mid-summer flower shows at our local horticultural society, would be the highlight of the gardener's season for exhibition. Long tables at the Horticultural Hall, would be filled with vases of various lilies, daylillies, annuals and perennials, as well as summer berries and a wide selection of vegetables from back yard gardens. 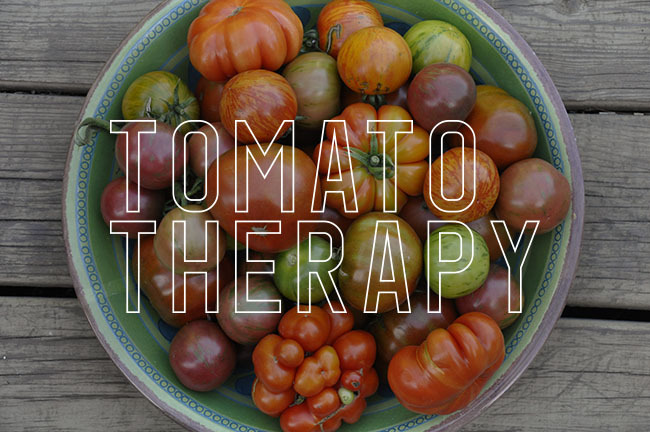 The first tomatoes are just thinking about turning ripe, but string beans, summer squash, mid-season cabbage ( my fav) and manhy other veggies would fill baskets and trays with fresh, young produce. I love this color palette, for some reason, it reminds me of summer days on northern lakes, with a good dash of 1940's lawn furniture. Don't ask, it just does. Bright red, Kelly green, golden yellow and foggy grays. High summer combine in a retro blend which sits smack on the edge of garish, yet, it somehow 'works'. The sparkler-shaped flower at the top is a Blood Lily (Scadoxus multiflorus ssp. katherinae), a summer flowering South African bulb that makes a fine house plant, but one that likes to get a little sleepy in the winter, when it may often loose all of it's leave. Never truly going dormant, ours spends each winter in the cold greenhouse under a bench, where is survives with a few ratty leaves, becoming larger and more beautiful each year. This year I repotted it into a much larger container. DUTCHMAN'S PIP, FALSE ARALIA'S AND GIANT JAPANESE BUTTERBUR'S MAKE THE GRAVEL WALK IN THE OLD ROSE GARDEN FEEL ALMOST TROPICAL. 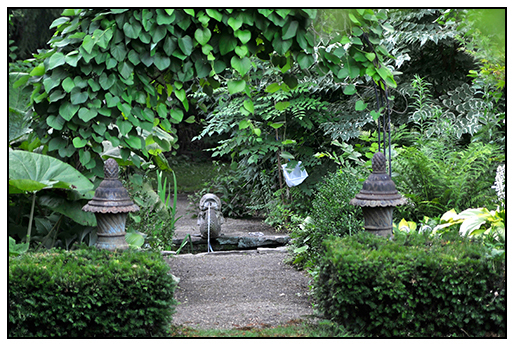 THE KOI IN THE OLD GOLDFISH POND (BUILT IN 1926 BY MY UNCLES) APPRECIATE THE STEADY STREAM OF WATER WHICH FLOWS INTO IT FROM THE FOUNTAIN. DAYLILIES ARE REACHING THEIR PEAK SEASON. MOST REGIONAL SHOWS FOR DAYLILIES OCCUR DURING THE LAST TWO WEEKS OF JULY. Another view of the fancy leaved heirloom Geranium's (Pelargonium's). They become more intense when exposed to the high summer sunlight. These pots sit on the hot gravel circle in the blue and gold garden. PAPAVER SOMNIFERUM - PAEONIFLORUM GROUP IS A SELECTION OF THE OPIUM POPPY WITH HIGHLY DOUBLE FLOWERS, IT IS ALSO SOMETIMES SOLD AS P. LACINIATUM - IT'S A STRIKING ANNUAL FOR THE JUNE AND JULY GARDEN WITH TALL STEMS AND BEAUTIFUL, TENDER FLOWERS THAT LOOK LIKE NOTHING ELSE ON EARTH. Morphine anyone? 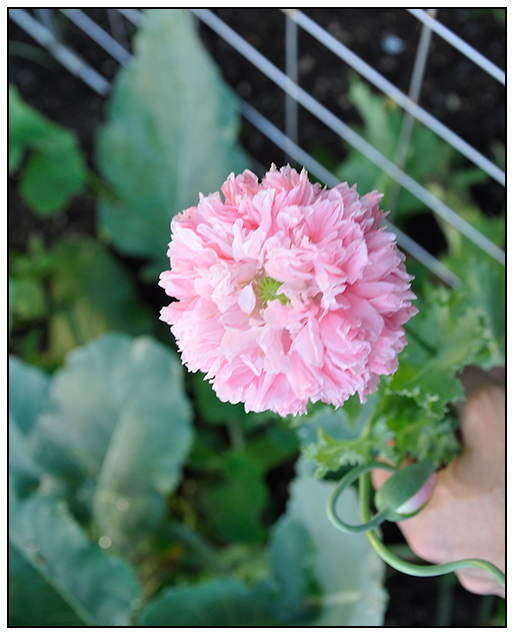 I've grown Opium poppies since I was a kid, but sadly, I never liked drugs, so apparently my crops are always wasted. Rarely seen in modern gardens, this poppy was a common heirloom plant in classic cottage borders at the turn of the century ( the 1899-1900 one, not the last one). 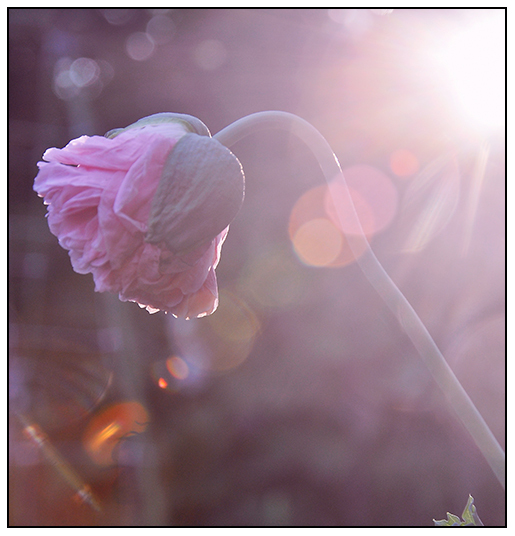 The Opium Poppy has a long and rich history, with some historians tracing cultivation of the species back to 4000 BC, perhaps no other garden plant has such a history so important to medicine and trade. I always wondered where modern medicine gets its poppy grown morphine and codeine from, for I could not imagine vase fields of Papaver somniferum growing in Oregon for Morphine. Most of the narcotic material used in modern medicine today comes from India and Turkey, where policies are established between the US government and those countries. Apparently Afghanistan is proposing a program where it may produce some medicinal opium similar to the deals struck with India and Turkey, with will help promote the economy in that country where the poppy is native. Regardless of what we all thinks about this plant and the politics related to it, there is hardly a plant more essential to human medicine than the this species of poppy. THINKING THAT YOU MIGHT BE INTERESTED IN GROWING YOUR OWN HOME-GROW ORGANIC MORPHINE? THINK AGAIN - YOU WOULD NEED A FEW HUNDRED PLANTS, AND ENOUGH MONEY TO PAY FOR A VERY GOOD LAWYER. A FEW PLANTS IN A HOME GARDEN IS OK THOUGH, JUST DON'T PLANT AN ACRE OF IT AND THEN START HARVESTING IT. 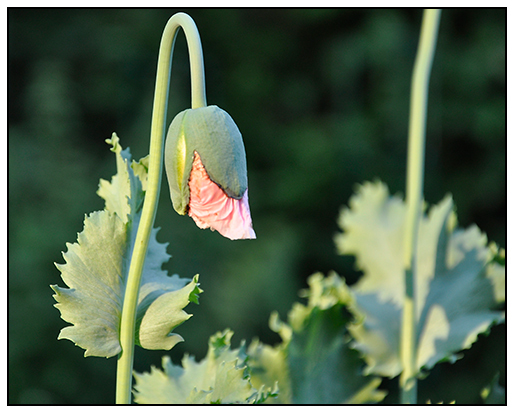 The buds and stems on P. somniferum are graceful and very tender. A strong breeze can cause an entire stand of seedlings to collapse, and a dog passing through the garden can ruin an entire bed with nothing stronger than a tail wag. We has Chris Chadwell , of the Sino-Himalayan Plant Association staying with us again this past weekend, with his son Matthew who has just graduated college. 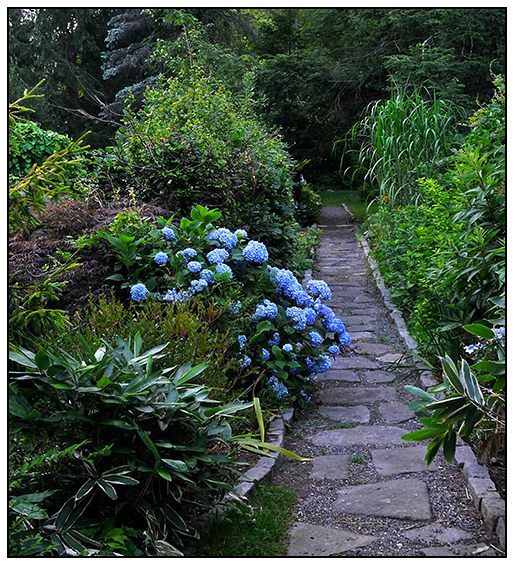 We were planning our trip with him to the Himalaya next summer, and in the scramble and prep for house guests, I forgot that our other good friend Kris Fenderson was hosting his biannual garden tour at his famous and fabulous garden in New Hampshire. The poppies reminded me first, because we had admired a bed of them there, when we were there two years ago. His single species with their pink, nodding buds remained in our minds. 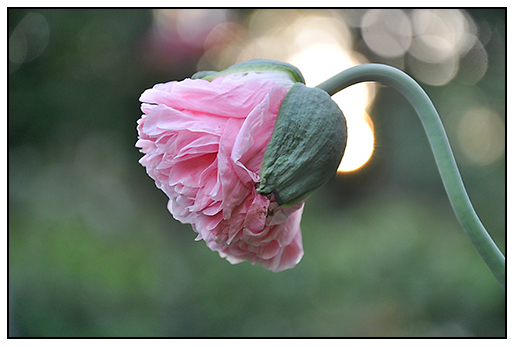 PAPAVER SEEDS ARE INDEED THE SAME SEED YOU FIND ON YOUR BAGELS, ON ROLLS AND IN POPPY SEED MUFFINS. IT'S TRUE THAT EVEN A FEW SEEDS IN A MUFFIN CAN CAUSE YOU TO FAIL A DRUG TEST. Sowing seed is easy, but P. somniferum is not an easy plant to grow, so I won't kid you. It prefers cool, damp springs and summers, and is absolutely despises being disturbed once seed is sown, sow thinly, directly into the garden can careful thin once you see seedlings with true leaves. The broader the area you sow in, the better chance you will have in getting a good crop. This year I made the mistake of sowing seed along side a row of Kohlrabi, and by the time I realized the mistake, it was too late, so I just carefully looked for seedlings, and then pulled out the Kohlrabi. Sowing in a prepared bed is best, so that you can keep weeds at a minimum, and watering the tender seedlings is easier. Once you have plants, there will be plenty of self-sown seedlings, just be careful when weeding, the seedlings remain small for many weeks, but you will learn to identify them from the weeds. I prefer to pick the highly ornamental seed pods in the fall, and then sow the seed in early spring in lightly tilled soil. ( you can order seed like I did this year, from Thompson & Morgan). A Chinese Lantern Lily? More like, neither.